I’ve found another topic for Ella that doesn’t contain spoilers – food! Be forwarned, lots of pictures of food in this post, so if you’re hungry, now’s the time to get the Thanksgiving leftovers if you have them. 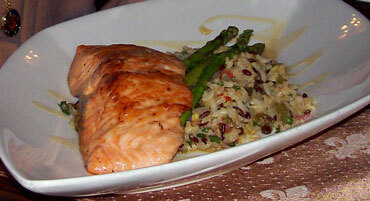 I didn't have a picture of the bastilla, but here's some salmon similar to what she eats at another meal. 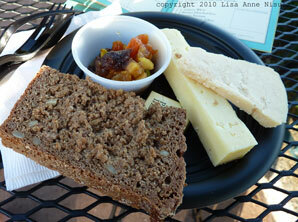 As you can see, I do have lots of other food pictures. 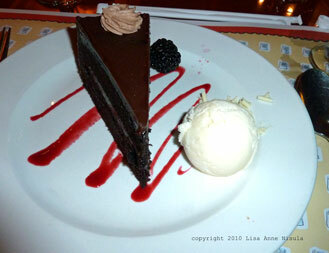 That is the chocolate cake I was thinking of whenever Ella has it for dessert, also eaten at Disney World. Charles doesn’t have nearly as much food mentioned as Ella does, but there is some. While they’re performing, Phichorian sends him off to buy pasties, which are sort of like a pot pie that’s been stuffed inside it’s crust. I don’t care for them myself (I still have the little kid dislike of having my food touching each other) but I picked it since it’s a very traditional sort of food preparation. 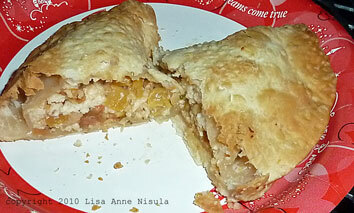 I learned from watching Rick Steves that Cornish pasties were popular with families of miners since they were easy to bring along and they could hold them by the thick crimping around the edge without washing their hands, eat the part with the filling, and through the crust edge away. There’s certainly other food mentioned, but those are the things I have pictures for, in other words, the things I’ve eaten on vacation since that’s the only time I take pictures of food. Sorry I missed posting when I was supposed to the last time. I was a little under the weather, but I’m feeling much better now, so here’s the post I was planning– some background on sprite knitting in Fantasy Kingdom XXI. The sprites of Pelimaa can knit spells into fabric. Not all of them use their magic this way, but Bobble from Fantasy Kingdom XXI is one who has learned how to cast those kinds of spells. Like any kind of knitting, the more skilled the sprite is, the more complex they can make their spells, and the easier it is for them to make simple items. One of Bobble’s favorite things to knit is socks with a warming spell knitted in. Phichorian has been known to buy them off Bobble and use them to smooth things over with castle guards. Bobble can knit them without too much concentration; if you know how to knit, imagine knitting socks with a stitch pattern you’ve used many times before. The first few times you need to concentrate, but after that, it becomes almost automatic. Socks with warming spells are usually what Bobble’s knitting when he’s nervous. From the description of the sweater, or the hat pattern on the cover, you can probably tell that sprite knitting has color work patterns in it. The spells themselves are what make the color patterns in sprite knitting, not different colors of yarn. Bobble knits with whatever he has on hand, usually undyed cream wool since that’s what’s readily available at the castle and it takes the spells well. As he knits, he casts the spell into the stitches and the pattern emerges. On the cover of Fantasy Kingdom XXI, you can see he only has one ball of yarn attached to his work but several colors in the project. Imagine a ball of plain yarn producing patterns like self-patterning sock yarns. The more complex the spell, the more complex the pattern and the more Bobble has to concentrate. Warming socks he can knit while talking and flying at the same time. For Charles’s sweater, he had to work in complete silence. Imagine a sweater with multiple stitch patterns in cables and lace and color versus a sock with one knit purl stitch pattern. If one pattern is off, say one stitch to the left or a cable turned right instead of left, the spell won’t work right. Colors and patterns are not consistent between sprites. Phichorian and many others at the castle would recognize Bobble’s warming socks from the color and pattern because they’ve seen them many times, but they wouldn’t know if another sprite’s socks were for warming or speed or were just socks unless they tried them on. And finally size. Bobble is very small, and he knits very small items. When he casts the last bit of the spell, just after he’s bound off the stitches and as he is binding the ends of the magic in, he can add a size spell if he wants. Sometimes he will have it grow to a certain size, but more often he just tells it to grow to the size of the owner and gives it a little nudge in the direction of human size. If you’d like to try some sprite knitting, I have the hat pattern from the cover of th book on my web site. (scroll to the bottom of the page) It is done in stranded color work, so it looks like something Bobble would knit, but the technique is completely different. For something closer to what Bobble does, use self striping sock yarn (two that are readily available are Red Heart Heart and Sole or Knitpicks.com Felici) either for the whole project, which is closest to what Bobble does, or to replace all but the background color, which is half way between the two. Of course you could use it to knit any basic sock pattern for Bobble style warming socks. Names are usually interesting to come up with, and since most of Fantasy Kingdom XXI takes place in another world, it needed unusual names. Here’s how I came up with some of them. Phichorian is an odd combination of the name Orpheus (a musician from Greek mythology) and terpsichorean (a word derived from the name of a muse referring to dance). Since he’s a bard, I thought those words fit him. Melissina was a name I thought I had read somewhere else that meant sweet. Later I found out I’d misremembered the name, but I was already used to calling her that and I liked it, so I left it. If Melissina was sweet, then her fiancé would be her opposite. “Amer” is the French word for bitter, so it became Amertious. I think I already had King Regulous named, so the idea that noble names in Pelimaa ended in -ous was already in the back of my mind. Regulus is the name of a star in the constellation Leo; I thought the other spelling looked more like his name. I changed the spelling of Rothgar too; it’s from Beowulf, but spelled Hrothgar in the poem. 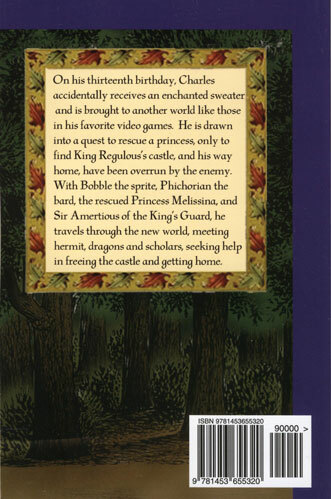 Honorious, Amertious’s father, has the same ending. I was watching MASH at the time, and Charles Emerson Winchester’s sister Honoria was mentioned in the episode, and Amertious’s father had his name. Bobble was an easy one. I wanted something knitting related and “Bobble” seemed to work better as a name than “Slip slip knit” or “Left Leaning Cable.” If you don’t knit, a bobble is several stitches worked into one stitch than knitted together to make a raised ball kind of thing, almost like a smooth pompom. The other names were either words thrown together (Shellwood, Flamebringer) and not terribly interesting (although I just realised that the two wise women are opposites name wise. Fire and water. Interesting.) or might be spoilers for the book. There is one more, the last one I came up with, Pelimaa itself. The place had no name for most of the time I wrote the book. Peli is Finnish for game and maa for land. Since the story world is based on Charles’s video game, that fit. Fantasy Kingdom XXI. The text is the same as the summary on the books page here. Mainly more of the trees from the front cover. If you were curious, the front cover image has Amertious’s sword, the smaller sword he taught Charles with (that’s the one on the ground), Phichorian’s mandolin and hat (he travels with a lot of instruments, that was the one that looked best in the picture), Bobble’s knitting, and Melissina’s crown. I was going to use Melissina’s sword instead, but there were already too many of those scattered around and it wouldn’t have looked right. Interesting bit of a fact, someone I knew who did re-enactments told me you never stick the point of your sword in the ground like they sometimes show in movies, bad for the point and gets it covered in germs which is not good if you accidentally cut someone later, although probably not a worry if you were fighting them for real. Ella and the Panther’s Quest. Again the same text as on the books page here. 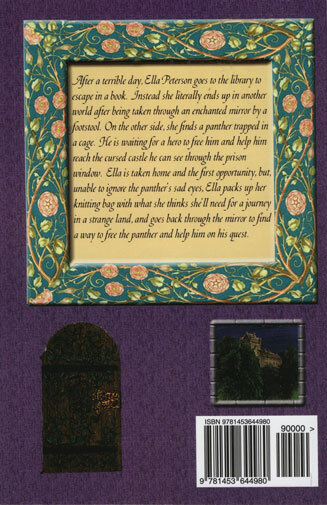 Then there’s the door in the hedge from about halfway through the book, and the window from the panther’s prison that Ella sees in the first chapter. The front cover has the panther and the footstool and Ella’s knitting. Since this is the first post of my blog, I’ll start at the beginning. The beginning of my books. I don’t know where the ideas came from, but I do know where both books started. Ella and the Panther’s Quest began with the footstool. Furniture with clawed feet seems like it ought to run around, so the idea of a footstool that suddenly gets up and walks away when you stand on it wasn’t hard to come up with. Then I needed someone to stand on it, and Ella appeared, nameless at the time, soon after. She had to find the footstool somewhere, somewhere where you can climb on the furniture without it seeming strange, and where a mysterious new piece of old furniture wouldn’t draw attention to itself. The first ruled out a lot of public places, and the second a friend’s house. The library met both requirements. I didn’t go through that logic though, as soon as I saw Ella, I knew that was where she would find the footstool and that they would go though the mirror. That was probably influenced by Through the Looking Glass, but I didn’t realize that until much later. The book she was looking at originally was Robin Hood, just because I liked how the line “It never would have happened if Maid Marion hadn’t been sitting on the top shelf,” sounded. When I caught the Alice connection, it was easy to modify the line to reflect that. Fantasy Kingdom XXI started when I was on an airplane, going to Orlando (technically Lake Buena Vista). “Once upon a time, there was a sprite who knit a sweater” and I knew the sweater was magic, and that he would promptly lose it, and it would be found by someone he never intended. I had been working on Ella, which was a fairly feminine story, so for some reason I wanted this to be a more neutral story, something a boy could like too. I like video games, have liked them even when they were mainly a guy thing, so I thought that would balance out the girly-ness of princesses and knitting sprites, although Bobble is not the least bit girly once you get past that first line. Of course if you’ve read the book, or looked at the sample chapters I have online, you know that line never made it into the book. I considered writing a prologue, showing Phichorian and Sir Amertious waiting for Bobble to finish the sweater, but the book was mostly finished at that point, and it seemed like it would slow down the start of the story too much, especially since the reader wouldn’t know the characters or why it mattered so there would be lots of introductions needed, so I didn’t go too far with that.